This Lithium powerhouse is priced to sell due to overstock. We've seen these as high as $14. In addition to great price, you get the Panasonic name - you know your battery is good. Get them for $4.49each - no limit! Made by GE-Sanyo (Eveready & Duracell equiv: EL123A & DL123A) 1400 mAh lasts 4 times longer than alkaline batteries! Get them here for $2.35 a piece, NO LIMIT! Used in AF and SLR cameras, this 6 volt lithium battery really lasts. No need to pay $6 on the other sites - get them here for $3.75 - GE Sanyo - there aren't any better batteries! Ge Sanyo CR2 Lithium Battery - for your digital camera - $2.50 each - no limit! 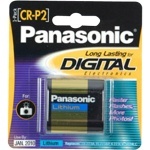 CRV3 Battery used in Digital Photography. We have them for $6.99 each no limit!